Fred, as he was known to all who worked with him, first conceived of a project to publish all of Darwin’s correspondence in 1974 on his retirement as President of the American Council of Learned Societies, and when he was already at work on an edition of the papers of William James. The importance of Fred’s personal contribution to the Project’s success was recognised in the United States in 2003 when it was one of the grounds for the award of the Thomas Jefferson Gold Medal of the American Philsophical Society – its highest honour. In 2002 Cambridge University was awarded the Queen’s Anniversary Prize for the Darwin Correspondence Project, given in recognition not only of the Project’s value to the scholarly community but also of its outstanding contribution to national and international cultural heritage. That the Project has been able to attract a considerable number of able researchers and editors across a full spectrum of disciplines is largely a tribute to the inspiring nature of his direction and to his own abiding enthusiasm and dedication. 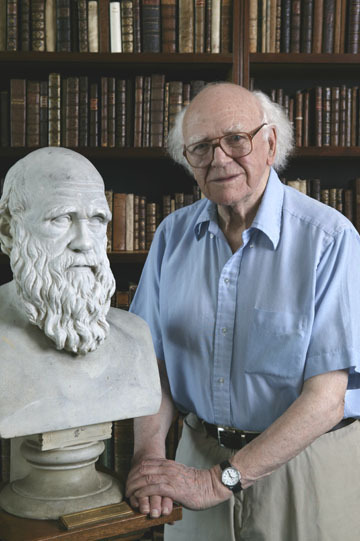 Both the nineteen-volume edition of the William James papers, and the fifteen volumes of the Darwin correspondence published in Fred Burkhardt's lifetime, were started in so-called retirement after a full career that began with degrees in philosophy from Columbia and a scholarship to Oxford. Convinced that philosophers had something to contribute to solving practical problems Fred served with the OSS in the Second World War, and was part of the US administration of Berlin in its aftermath. He became a dedicated and gifted academic administrator, serving as president of Bennington College, the liberal arts college in Vermont, and then as president of the American Council of Learned Societies in New York at a critical stage in its history. That was a return to his roots as Fred was born in Brooklyn, the son of German immigrants. He was a trustee and then chairman of New York Public Library and a member of New York City’s Board of Higher Education. Fred’s association with Cambridge brought him honorary fellowship of Clare Hall, and many friends. Fred and his wife, Anne, were for many years regular summer visitors to the manuscript room of Cambridge University Library, where they worked on the Darwin correspondence together. President, Bennington College, Vermont, 1947–57; Deputy Director, Office of Public Affairs, US High Commission for Germany 1950–51; president, American Council of Learned Societies, 1957–74. General editor, The works of William James (19 vols. Harvard Press, 1975–88); founding editor, The correspondence of Charles Darwin, (15 vols. to date, CUP, 1985–); editor, A calendar of the correspondence of Charles Darwin, 1821–1882 (Garland 1985; 2d ed. CUP, 1994); editor,Charles Darwin’s letters: a selection 1825–1859 (CUP, 1996, 1998), Origins: selected letters of Charles Darwin, 1822–1859 (CUP in press),Evolution: selected letters of Charles Darwin, 1860–1870 (CUP in press). Editor, translator: J. G. Herder God, some conversations on Spinoza’s system, 1940, 1962; editor, Cleavage in our culture, 1952; contributor,The comparative reception of Darwinism, 1975.